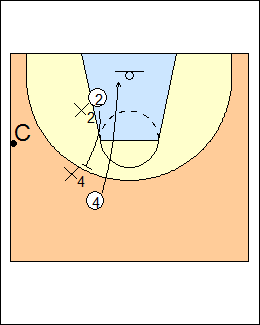 2-on-2 breakdown drills for their flex offence, see Offence - DeMatha flex, Shooting - DeMatha flex. Coach slaps the ball, 2 cuts low, coach passes to the wing, it's live. Go again if there is no pass (the screen was not good or 2 was not patient, 5 has to hit X2, and 2 has to make sure he hits him). See Attack/defend - 3 on 3 flex screens. 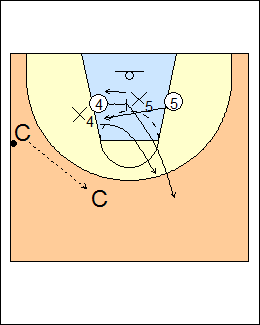 Coach slaps the ball, 2 upscreens for 4, who has to be patient, read the defence, cut over the screen or cut straight off it if X4 really tries to deny (shown). Coach can pass to 4 or 2. If defenders switch, there is a mismatch inside or outside, play basketball (be a player, not a robot). 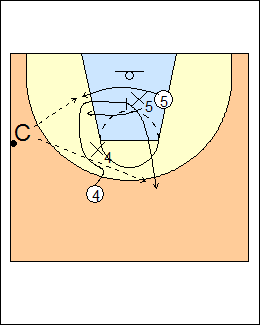 See Attack/defend - Pitt 2 on 2 backscreen, 3 on 3 back-down-UCLA screens. Coach slaps the ball, 4 cuts down, pauses, sets the screen, 5 goes opposite his defender, 4 sprints to the top once 5 clears. 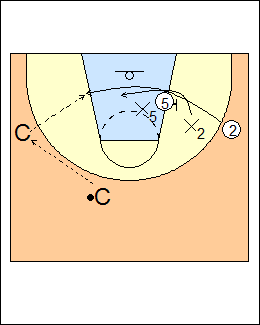 See Attack/defend - 3 on 3 cross-screen downscreen, 3 on 3 downscreen cross-screen. See Shooting - DeMatha flex (block-to-block screen).